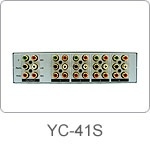 The YC-41S is a 4x1 switcher, offering flawless and seamless switching of all HDTV and SDTV video formats as well as Digital Coax and Stereo L/R audio signals. It accepts up to four different input sources and you can seamlessly switch (select) any of these inputs to drive the output, without any signal degradation. 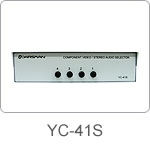 The YC-41S can be controlled by its front-panel manual control button. Your video can be in any of the following formats or combinations: Component (YPrPb), Composite Video. The port of digital PCM can also be used as the Composite Video. It is universally compatible with all HDTV or SDTV formats: 480i, 576i, 480p, 576p, 1080i/540p, 720p, and 1080p. Your Audio can be Left and Right stereo or digital PCM. •All known SDTV and HDTV formats are accepted at 50 Hz or 60 Hz, including 480i, 576i, 480p, 576p,1080i/540p, 720p, and 1080p. Net Weight(Unit Only) 1Kg Approx.